The Russian passenger plane which crashed over the Sinai on the 31st October was likely brought down by a terrorist bomb the British government has said. Evidence gathered by US and UK intelligence services appears to suggest the plane was destroyed by a bomb placed on board by someone with access to the plane. The apparent downing of flight 7K9268 which resulted in the loss of 224 passengers and crew has once again provoked a rethink of airline security. There are a number of things that appear to point to a probable terror attack. Soon after the plane crashed, a group linked with ISIL claimed responsibility for bringing down the jet saying it was in retaliation for Russian bombardment of Islamic State targets in Syria [RT]. The claims were immediately dismissed by Egyptian and Russian officials who said the militants did not have surface-to-air missiles with a range long enough to attack high-flying passenger planes. But while a missile might have been dismissed, there was still the possibility a bomb could have been placed on board. Reports later emerged that "unusual sounds" could be heard on the recovered voice recorder [CNN / Guardian / Independent]. 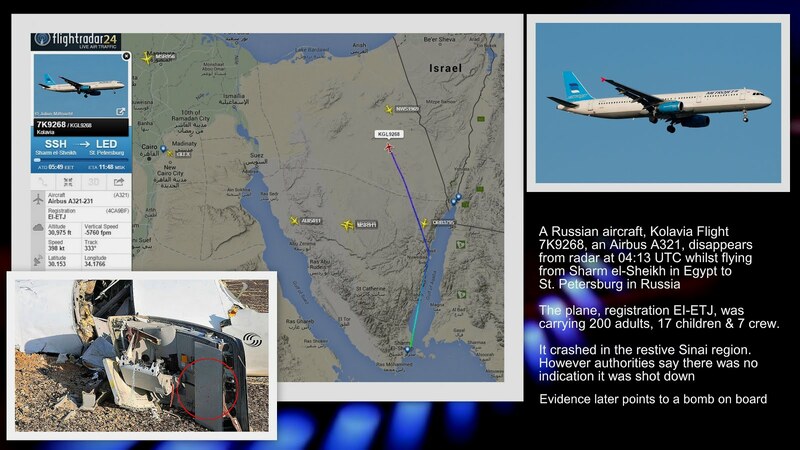 Whilst investigators have not officially released data or findings, the Interfax news service said it had seen a transcript of the cockpit recordings from the black boxes being examined by Egyptian officials. Interfax said that the cockpit recordings from the Metrojet flight revealed "unusual sounds" at the moment the plane went off the radar and went on to say that no distress call was issued from the pilots. US officials maintained that the plane had not been shot down. "There is no way it was brought down by a missile or anti-aircraft fire," the official told Fox News. However, by Tuesday 3rd November there were reports that US satellites had detected a "heat flash" at the same time the plane disappeared from radar [Fox News]. The US intelligence community believed that a fuel tank explosion or bomb may have been the source of the heat signature, NBC News reported. Concerns were heightened further by the plane's owner, Kogalymavia, which uses the brand name Metrojet, who insisted that neither human error nor a technical malfunction could have caused the crash, and cited an "external force" as the cause of the crash [RT]. Reports gradually surfaced suggesting that intelligence agencies had 'intercepted communications' which indicated Islamic State fighters had played a role [Daily Mail]. US officials said intelligence suggests the Islamic State of Iraq and the Levant [ISIL] or another terrorist group may have had "an assist from someone at the airport" and the British security services have discovered evidence of a plot to carry out a major atrocity. Furthermore the latest photographs of the wreckage of flight 9268 appear to show holes in the fuselage punched from the inside out, suggesting an explosion inside the Airbus A321. Internal components including part of a door also appeared to have been peppered with shrapnel from inside the cabin [Telegraph]. Bomb "more likely than not"
By Thursday the British PM David Cameron announced that it was "more likely than not" that a bomb downed the Russian plane. As a result he made the executive decision to stop all flights in and out of Sharm el-Sheikh. According to various sources MI5 had intercepted "chatter" from extremists in the Sinai Peninsula which further reinforced the theory that ISIL or associated groups had brought down the plane. The grounding of flights while prudent, has been criticised by Russia and Egypt. Russia has said the British assertion that the crash was terror related was premature adding that the investigation into the cause could take several months. Egypt have also criticised the move which will undoubtedly have a negative effect on the country's lucrative tourist industry. The UK government decision left thousands of British tourists stranded in Sharm el-Sheikh. Speaking at Sharm el-Sheikh airport on Friday 6th November the British Ambassador to Egypt John Casson said the aim was "to get as many people as home as soon as possible." However Over capacity as well as increased security was slowing things down leaving many people uncertain as to when they might be returning to the UK. Early Friday Easyjet said that Egyptian authorities had suspended UK airlines from flying into Sharm El Sheikh and that this would result in the cancellation of its flights from the holiday resort. However it later emerged the delays and problems were less political and had more to do with capacity at the airport [Sky News]. The lack of information as well as cancelled or delayed flights resulted in tense scenes at the airport, with a confrontation between angry passengers and Britain's ambassador to Egypt John Casson. The ambassador said the situation in Egypt was "complex and difficult" but the Government was working with the Egyptian authorities to get holidaymakers home safely as quickly as possible. However only 8 of 29 scheduled flights left on Friday and the passengers were only allowed to take small amounts of hand luggage. Check-in bags were to be sent on separate flights. Airline security since 9/11 has primarily focused on the passenger and their baggage. Security checks have increased with a number of items being banned from carry-on bags. But following the downing of flight 7K9268 the focus has shifted to personnel who work airside. Indeed the personnel who work behind the scenes at airports around the world may be the weak link. How stringent are the checks on those who work airside, such as baggage handlers? These are the questions now being raised by airlines and security agencies. 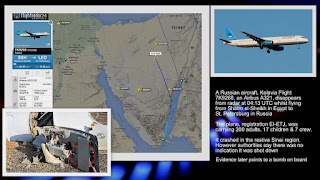 In fact, despite earlier criticism of Britain's decision to ground flights to Sharm el-Sheikh, Russian intelligence has said it is "reasonable" to suspend flights to Sinai region until the cause of the crash of flight 7K9268 is established. It is a feeling echoed by those who work in the airline industry too. "We cannot afford to be complacent about security issues" former British Airways pilot Alastair Rosenschein told Victoria Derbyshire on the BBC on Friday morning. Already, baggage handlers, catering staff and other airport workers are being interrogated to determine whether one of them may have been given a bomb to place on board the aircraft. But it is likely that security at other airports will also come under the spotlight in the days to come.